On Thursday, Canadians witnessed the first ever test drive of an autonomous vehicle on a public street in Ottawa. The vehicle, which was powered by Blackberry QNX technology, was taken for a spin around Kanata North Technology Park this afternoon by Mayor Jim Watson, Coun. Marianne Wilkinson, Blackberry QNX head John Wall and BlackBerry QNX software developer David van Geyn. 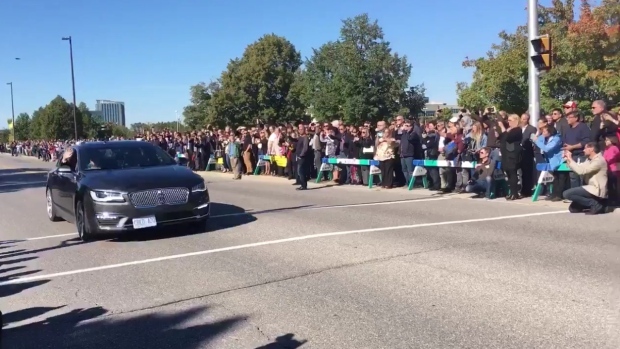 During the live demonstration, CBC News reports that the vehicle stopped at a traffic light while people crossed the road. The report also suggests that Nokia will soon be brought on board for the next phase in order to add LTE capabilities to the vehicles. “Ottawa has established itself as an innovative and smart city, is home to a diverse technology hub, and has the expertise, new technology and talent needed to spark autonomous vehicle innovation. The City of Ottawa announced that it will be partnering with the QNX team at Blackberry to test the new technology.